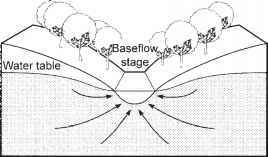 The volume of flow moving past a point over some time interval is referred to interchangeably as discharge or flow. Usually it is calculated from measurements of width (w), depth (d), and current velocity (v), and expressed in m3 s 1 or ft3 s 1 (cfs). In practice, discharge is estimated by dividing the stream cross section into segments, measuring area and velocity for each, and summing the discharge estimates for the segments (Figure 2.7). 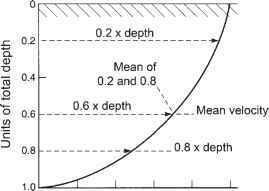 Velocity is measured at the midpoint of the segment and (in shallow streams) at 0.6 depth below the surface. 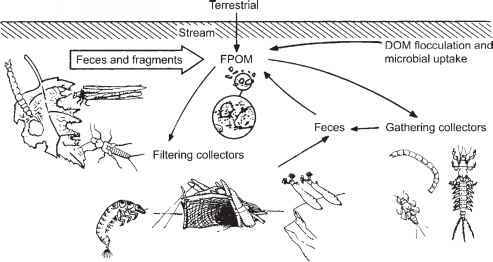 At least ten subsections are required, and none should have more than 10% of the total flow (Whiting 2003).